If you're not fortunate enough to join us today, you can cheer us on via NBC at 3:30PM EST. Gather your friends at home, or head to your local watering hole and cause a ruckus! 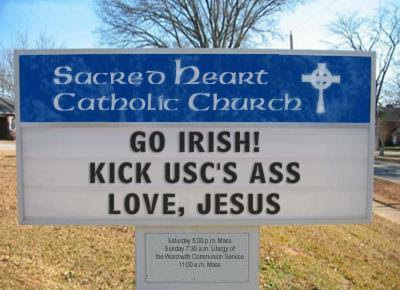 Especially to all my loyal ND fans back in Southern California... make those sorry SC fans want to leave the bar!!! Big game today... USC is trying to earn its way back into the discussion about a national championship. Meanwhile, we at Notre Dame are looking to reassert ourselves as a serious top-tier program--a team that can beat an elite program like USC. This is more than just getting the W. This is for the heart and soul of Notre Dame--breaking the streak of SC defeats--waking up the echoes. It can be done. Trojans break! We're rooting for you guys! Go get 'em! 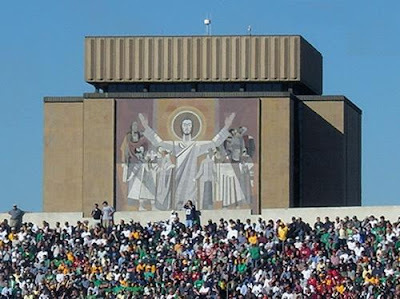 ...Don't forget, Irish, touchdown Jesus will be looking over you. And he's already phoned in his support. As always... pre-game predictions, real-time cheering/cursing, and your general thoughts are all welcome in the comments! 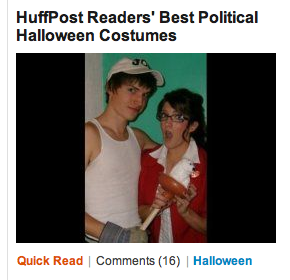 Lefty's Writer Spotted on The Huffington Post! Lefty's is proud to take a moment to recognize it's own mini-celebrity, writer, Andrea Watts, who was spotted on The Huffington Post homepage today! Don't be fooled by the Sarah Palin disguise, and Joe the Plumber on her arm. We at Lefty's can assure you that this version of the wolf huntress is far more intelligent, doesn't really shoot wolves from helicopters, and "pals around with terrorists" like us. This little dose of hilarity is brought to you by Jed Lewison at DailyKos. Not to be redundant after Tim Ryan's post, but I think it's nice to let our Lefty's readers know that the Observer has been covering their hard work. Here's a copy of the article from today's (10/12) paper. Thanks, Robert Singer! The College Democrats of Notre Dame co-sponsored the "Health Care for All" rally in downtown South Bend Saturday to support health care reform, a cause they say will make for a wiser system of medical insurance - and a healthier and wealthier nation. Attended by about 150 community residents and students, the rally kicked off at 1:30 p.m. in front of the Morris Performing Arts Center. "It becomes unaffordable for our businesses to provide health care for the people who work for those businesses," Congressman Joe Donnelly, a Democrat who represents Indiana's 2nd District, said at the rally, arguing the current system is unsustainable in the long term. The rally was intended to put political pressure on Indiana's Democratic elected officials, College Democrats co-president and junior Christopher Rhodenbaugh said. "The rally is about showing the widespread support in South Bend and the surrounding area for health insurance reform, showing the members of Congress that this is something that people really need and want and anyone who votes for it, this community will support and volunteer for them when they come up for re-election," he said. To demonstrate public support for health care reform, the College Democrats have been calling Indiana residents during a weekly phone bank. Their goal is to reach five thousand people before the health care bill is submitted for a vote, which should be in mid-November, Rhodenbaugh said. Rally attendee Sean Fritts shared the story of a family tragedy, which he believed could have been avoided with affordable health insurance. When his wife Jennifer sought medical care for a cold during her pregnancy, the hospital turned her away. The next day, feeling more ill, Jennifer went with Sean to a different hospital. There, they lied that they had insurance, and she was diagnosed with double pneumonia. But the finding came too late - 55 days later, she died in an intensive care unit. Citing a recent study by Harvard Medical School and the Cambridge Health Alliance that found 45 thousand deaths each year are linked to a lack of health insurance, Rhodenbaugh voiced a moral argument for health care reform. "We believe that health care is a human right and that it is a social justice issue and to have one of the wealthiest countries in world have 45 thousand people die every year because of lack of insurance is wrong," he said. Sophomore Tim Ryan, who attended the rally, said that a for-profit system of health insurance is immoral. "It's unethical," he said. "It's a violation of human rights." Freshman James Crowe said any short-term costs will be outweighed by a system that cuts expenses in the long term. "In the short run, it will send us into a deficit, but in the long run, it will be more efficient," he said. "The fact that the public option means a government takeover" is a part of the debate that Rhodenbaugh believes is often misunderstood. "President Obama said in the health care speech that with the public option, roughly five percent of the population will be getting health insurance from the government," he said. About 15 people attended an adjacent counter-demonstration in opposition to public intervention in the health care system. Tim Grimes, founder and assistant organizer of Michiana's "9/12 Project," said he believed President Barack Obama's health care initiative was part of a larger scheme by the current administration to seize absolute control of the government and implement Obama's "total socialistic views." Grimes also saw a conspiracy in the program proposed to limit carbon emissions, claiming that "cap-and-trade is going to make Al Gore rich." Rhodenbaugh said he was displeased with the debate's level of discourse thus far. "I am unhappy with how the debate among the American people has gone about. The fact is that it's been very much reflex politics," he said. "I wish there was more thoughtful debate. A lot of people forget that Medicare is a successful government health insurance program." This is kind of random, but I liked it. A catchy autotune remix of Carl Sagan and Stephen Hawking. Yesterday afternoon, this writer and maybe about 15-20 other enlightened ND liberals made their way to the courtyard in front of the Morris PAC for a rally in support of our President's healthcare reform plan. Naturally, the teabaggers could not allow such an event to go on without making sure we knew their feelings, which were well summed up by one man's hilariously misspelled sign "Oboma lies". If I ever meet this Oboma, I'll make sure not to trust him. Another protester simply covered her sign with pictures of guns. Disturbing. But I digress. After an "interesting" (but passionate) take on our national anthem, the speakers began to take the stage. Congressman Joe Donnelly made a surprise appearance. It was nice to see him finally (at least by all appearances) choosing the right side. He's not necessarily a leader in the House, but every vote is important. Another elected official, Congressman State Representative David Niezgodski, showed up and gave a refreshingly impassioned speech about the importance of real reform. It was great to hear from an elected official that actually listens to the needs of the people, rather than the lobbyists. Other speakers included leaders of the Latin American Union, the AFL-CIO, and a woman with complications from MS who, despite having insurance, is still paying $1,000 a month out of pocket. Not easy to do when only living off social security and disability pension. She gave my favorite line of the afternoon: "Death panels? We already have death panels. They're called insurance companies." But by far the most moving moment was the man who told us the story of how he lost his wife. She was 24, pregnant, and without insurance, when she came down with a mysterious illness. They went to a doctor, but because of her lack of insurance she was told there was little they could do, given an inhaler, and sent home. The next day her condition visibly worsened, so she was taken to another hospital and put on a respirator. At the cost of $22,000 a day. With no insurance. (At this point, the man was understandably unable to continue, so a woman whose relation to the family I did not catch continued the story for him.) Naturally, no average citizen is unable to sustain that sort of payment without assistance, so she was taken off the respirator. The baby was lost. Then she passed away. Leaving her husband and her two and a half year old child. Her memorial service was yesterday. Her husband came from the service to the healthcare rally. You can't hear a story like that and not choke up. When something like this happens in a country as wealthy and supposedly morally upstanding as America, the system is broken. Healthcare is a basic human right, and if we are unable to pass meaningful reform, then we will be hearing more stories like this every day. CORRECTION: David Niezgodski is a state representative, not a congressman. Maybe he should be one, though.